Peter Bolesław Schmeichel, MBE (Danish pronunciation: [pedɐ ˈsmɑjˀɡl̩]; born 18 November 1963) is a Danish former professional footballer who played as a goalkeeper, and was voted the IFFHS World's Best Goalkeeper in 1992 and 1993. He is best remembered for his most successful years at English club Manchester United, whom he captained to victory in the 1999 UEFA Champions League Final to complete the Treble, and for winning UEFA Euro 1992 with Denmark. Born in Gladsaxe, Copenhagen, Schmeichel was famous for his intimidating physique (at 1.91 m (6 ft 3 in) tall and weighing close to 100 kg (15 st 10 lb) during his playing days), and wore specially made size XXXL football shirts. A fierce competitor, he was known for his loud, unstinting criticism of mistakes he believed the defenders in front of him committed. Unusually for a goalkeeper, Schmeichel scored 10 goals during his career, including one for the national team. He is also the most capped player for the Denmark national team, with 129 games between 1987 and 2001. In addition to Euro 92, he played for his country at the 1998 FIFA World Cup and three additional European Championship tournaments. He captained the national team in 30 matches. He also represented Gladsaxe Hero, Hvidovre, Brøndby, Sporting CP, Aston Villa and Manchester City in a career that lasted from 1981 until 2003 and yielded 24 trophies. Regarded as one of the greatest goalkeepers of all-time, the IFFHS ranked Schmeichel among the top ten keepers of the 20th century in 2000, and in 2001, Schmeichel won a public poll held by Reuters, when the majority of the 200,000 participants voted him as the best goalkeeper ever, ahead of Lev Yashin and Gordon Banks. In 2003, Schmeichel was inducted into the English Football Hall of Fame in recognition of his impact on the English game. In March 2004, he was named as one of the "125 greatest living footballers", at the FIFA 100 celebrations. His son, Kasper, is also a professional football goalkeeper, currently playing for Premier League side Leicester City and the Danish national team. Peter Schmeichel was born in the Søborggård parish of Gladsaxe, Denmark, to Inger, a Danish nurse, and Antoni Schmeichel, a Polish jazz musician. He held Polish citizenship until 1970 when he, his father, and his three sisters became Danish citizens. Schmeichel inherited his middle name – Bolesław – from his great-grandfather. He spent his early years in the town of Buddinge, Copenhagen, and began his football career playing for a team in the adjacent suburb of Høje-Gladsaxe. His first match came on 7 August 1972 at the age of 8. After a two-and-a-half-year unbeaten run, Schmeichel was approached by BK Hero, a team from a few divisions above Høje-Gladsaxe and with one of the largest youth football schemes in Denmark. BK Hero merged with Gladsaxe BK in 1979 to form Gladsaxe-Hero BK, and Schmeichel was presented with the opportunity to play for the Zealand FA's junior representative team. Eventually graduating to the Gladsaxe-Hero senior squad, Schmeichel met his first mentor in Svend Aage Hansen, the first team coach at the club, and later to become his father-in-law. With Gladsaxe-Hero already relegated from the Danish Third Division with three games to go, Hansen promoted Schmeichel and six others from the youth team for a match against IF Skjold Birkerød. The team lost 1–0, but Schmeichel received mentions in local newspapers for his personal performance. At the end of the season, Hansen explained to Schmeichel his plan for the future, which involved Schmeichel spending two more seasons with Gladsaxe-Hero BK before moving on to Hvidovre, playing for the Danish national team, and eventually having a successful career abroad. Schmeichel admits that he had received an offer to play for B 1903's youth team, but he turned it down as the club "seemed a bit boring". The following season Gladsaxe-Hero needed only to avoid defeat to Stubbekøbing to prevent relegation from the Danish National League. In the end, Schmeichel played one of the best games of his career and Gladsaxe-Hero won the match. At the end of the game, Hansen's daughter, Bente, ran onto the pitch and hugged Schmeichel. The two ended up going out as a couple, and they eventually got married. Before becoming a professional footballer, Schmeichel had to work a number of jobs to make ends meet. His first job came in the dyeing department of a textile factory, but safety concerns led to his resignation. He then spent 12 months as a cleaner at an old people's home, before taking up an office job with the World Wildlife Fund. He originally worked in the organisation's shops, but three weeks after he joined, the store manager left and Schmeichel was promoted to the position of sales manager. Soon after, Schmeichel was called upon to do his four weeks of compulsory military service. However, this coincided with Hvidovre's summer training camp in Portugal, which he was permitted to go on with the proviso that he completed his military service the following month. Nevertheless, the delicate organisational situation that arose between the WWF, the Danish defence department and Hvidovre prompted Schmeichel to give up working for the WWF. A job with his father-in-law's flooring firm came next, until he realised that his knees could not support his 15 stone (95 kg) frame for eight hours a day, and he was offered a job with the advertising firm owned by Hvidovre's chairman, Niels Erik Madsen. This was to be his last job outside football, as he was offered a contract with Brøndby the following spring. Despite the fifth best defence in the league, conceding 40 goals in 30 games, Schmeichel and Hvidovre finished in 14th place and were relegated in 1985. After only a single season, the club bounced right back to the 1st Division, but Schmeichel was lost by Hvidovre to Danish runners-up Brøndby IF before the 1987 season. Winning the Danish league in his first year, he joined a club which he helped turn into a success. He made his debut for the Danish national team in May 1987, under national manager Sepp Piontek, and was selected for the Euro 88 tournament, where he eventually became Denmark's starting goalkeeper, after initially serving as a back-up to Troels Rasmussen in Denmark's opening 3–2 defeat to Spain; Denmark lost both of their remaining two matches 2–0 to West Germany and Italy, however, and were eliminated in the first round of the competition. In all, Schmeichel and Brøndby won four championships in five seasons. The climax of his Brøndby career would come in the European 1991 UEFA Cup competition, which saw Schmeichel as an important part of the team that reached the semi-finals, keeping seven clean sheets in the competition. The club was eliminated from the tournament following a 2–1 away defeat to Roma with a last-minute goal by Rudi Völler. Following the tournament, Schmeichel was voted 10th in "The World's Best Goalkeeper 1991" poll by the IFFHS. Following his showings on the international scene, Manchester United signed Schmeichel on 6 August 1991 for £505,000, a price described in 2000 by Manchester United manager Alex Ferguson as the "bargain of the century." It was mainly because at the time, Schmeichel was a relative unknown outside of Denmark, especially within the United squad members. Schmeichel played the bulk of his career for United, eight years in total. With United, Schmeichel won five FA Premier League titles, three FA Cups, one League Cup, and the UEFA Champions League. Manchester United finished as runners-up in Schmeichel's first season (also winning the Football League Cup for the first time in the club's history), but it was on the international stage that Schmeichel enjoyed his biggest success that year. In the Danish national team under new national manager Richard Møller Nielsen, Schmeichel was Denmark's starting goalkeeper at the Euro 92 tournament which they won. Although Denmark initially finished behind Yugoslavia in their qualification campaign for the final tournament, the latter nation were banned from the competition, while Denmark replaced them in the finals. Schmeichel made a string of important saves during the tournament, keeping a clean sheet in Denmark's opening 0–0 draw against England, and producing decisive stops against Eric Cantona and Jean-Pierre Papin in a 2–1 win over France to advance to the last four. In the semi-finals against defending champions the Netherlands, following a 2–2 draw after extra time, he stopped a penalty kick from Marco van Basten – the only miss of the shoot-out – which enabled Denmark to advance to the final on a 5–4 victory. Schmeichel also made several decisive saves in the final, and even held a cross with one hand, keeping a cleansheet in his nation's 2–0 victory over Germany. For his performances throughout the season, he was elected "The World's Best Goalkeeper of 1992" by IFFHS. In the 1992–93 season, 22 clean sheets from Schmeichel helped United win the Premier League championship, the first time the club had won England's top trophy in 26 years. Schmeichel was once again named "The World's Best Goalkeeper" in 1993. In January 1994, Schmeichel fell out with Ferguson, as United had squandered a 3–0 lead to draw 3–3 with Liverpool. The two had a row where Schmeichel "said the most horrible things", and he was subsequently sacked by Ferguson. A few days later, Schmeichel made an improvised apology to the other players. Unknown to him, Ferguson was eavesdropping on this, and he let Schmeichel stay at Manchester United. Schmeichel and United repeated the Premier League championship win at the end of the season, also capturing the FA Cup. At international level, however, he suffered disappointment as Denmark failed to qualify for the 1994 FIFA World Cup. Schmeichel played for Denmark at Euro 96, hosted by England. The defending European Champions went out in the preliminary group stage, despite delivering results equivalent to the Euro 92 tournament in the first round. Following a match against Arsenal in November 1996, Schmeichel was accused of racism by Arsenal striker Ian Wright. During the game, Schmeichel and Wright had a number of controversies, and at the end of the game, the two players confronted each other on their way off the pitch. After the game, news emerged of a police inquiry into the incident, where it was alleged that Schmeichel had made a racist remark. After months of politicising by The FA and The PFA, who wanted a "converted" Schmeichel as their posterboy of the "Kick Racism out of Football" campaign, no evidence was found and the case was dropped. With his departure, Manchester United had trouble finding a replacement for him, going through several high-profile goalkeepers including Mark Bosnich, Massimo Taibi, Fabien Barthez, Tim Howard and Roy Carroll before finally buying Edwin van der Sar, who Sir Alex Ferguson considered the best goalkeeper to have played for the club since Schmeichel. Schmeichel played his 129th and last international against Slovenia in 2001. He kept a clean sheet in the match – something he had done, staggeringly, in 42 per cent of his appearances for Manchester United. Schmeichel will be remembered as far more than being the greatest goalie in the history of De Rød-Hvide and the Red Devils. Indeed, in a 2001 Reuters poll, he beat Lev Yashin and Gordon Banks to be named the finest keeper in football history. Despite being a goalkeeper, he would run into the attack on corner kicks if his team was behind. The sight of him going up for the corner was a great distraction to opposing defenders. He scored a goal in this fashion, for Man United, in a UEFA Cup match against Rotor Volgograd at Old Trafford in September 1995. He scored in the last minutes of the game to tie the match 2–2, though United were eliminated from the tournament on the away goals rule. Schmeichel decided to leave English football at the end of the 1998–99 season, as the gruelling 60-game season, which came with playing with a successful club, was threatening to undermine his high standards at the age of 36. Seeking a slower pace of football, he moved to Sporting CP, where he penned a two-year contract. In his first season with the club, he won the 1999–2000 Primeira Liga title, putting an end to the team's 18 years without a championship. He scored his only goal for the Danish national team, a penalty kick in a 2–2 draw against Belgium, in a June 2000 warm-up match for Euro 2000. He represented Denmark at Euro 2000, where the team was eliminated in the group stage. He announced his retirement from the national team in February 2001, and played his final match (his 129th international appearance) two months later, captaining the side in a 3–0 friendly win over Slovenia at Copenhagen's Parken Stadium; he was substituted in the 65th minute to a standing ovation, replaced by long-time back-up Peter Kjær. His second year with Sporting was remarkable in that it was the first time in 14 years, since his Hvidovre days, that Schmeichel's club had finished below second place in the league. Schmeichel stated his wish to activate a contract option of a further year at Sporting in January 2001, but eventually decided to leave the club when his contract expired in June 2001. Schmeichel returned to England with Aston Villa in July 2001, signing a one-year contract with the option to extend it by a further year. On 20 October 2001, Schmeichel became the first goalkeeper to score a Premier League goal, in a 3–2 defeat away to Everton; this feat has been repeated only four times: by Blackburn Rovers' Brad Friedel on 21 February 2004, also from a corner kick; by Tottenham Hotspur's Paul Robinson from a free-kick on 17 March 2007; by Everton's Tim Howard on 4 January 2012; and by Stoke City's Asmir Begović on 2 November 2013. Schmeichel left Aston Villa after one season after he fell behind Peter Enckelman in the club's pecking order under new manager Graham Taylor, who had replaced John Gregory in February 2002. In 2002, Schmeichel completed a move to Manchester City on a free transfer. He played only one season, in 2002–03. Schmeichel's record in the Manchester derby is exceptional, in that he was never on the losing side. During his nine years with Manchester United, they were unbeaten against Manchester City, while in his single season with City, they won at Maine Road and drew at Old Trafford. Schmeichel announced his retirement from football in April 2003. In December 1999, Schmeichel became the owner of his childhood club Hvidovre IF, but withdrew from the club in June 2002. Schmeichel worked as a pundit for the BBC after retiring, being a regular analyst on Match of the Day until 2005. He then began hosting live UEFA Champions League matches on Danish television channel TV3+, with Preben Elkjær and Brian Laudrup the studio pundits. However, he still works occasionally as a pundit for the BBC. His popularity in Britain is perhaps best measured by Chesney Brown on the Manchester-based soap opera Coronation Street, naming his former dog (a Great Dane) "Schmeichel". He also took part in Soccer Aid, and played for the Rest of the World team, who lost 2–1 after he was substituted at half-time. Schmeichel was a contestant on the 2006 series of the BBC's popular Saturday night TV programme Strictly Come Dancing, but was voted out by the public on his 43rd birthday. He also appeared on The Weakest Link in the UK, but he was voted off as the weakest link in the first round. 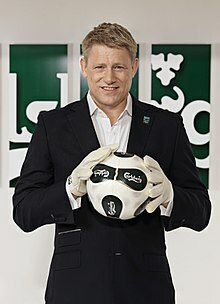 On 31 August 2007, an investor group including Schmeichel announced their intention to invest 250 million DKK (€33.5 million) in the football club Brøndby IF and make him sports director. This was announced in a press conference in Danish at a hotel in Copenhagen. The offer fell through when Brøndby failed to accept the offer within the group's deadline. In February 2007, he became the host in a new quiz, on TV3 named 1 mod 100 (the Danish version of 1 vs. 100). In 2008, he became the host of the European version of the Discovery Channel programme, Dirty Jobs. In April 2018, Schmeichel appeared on state owned Russia Today, in a TV programme called The Schmeichel Show. He received criticism from Danish media for his appearance in it. Schmeichel is widely regarded by pundits, as well as both former and current goalkeeping colleagues, as one of the greatest goalkeepers of all time, and also as Denmark's greatest goalkeeper ever, and has been described as a modern, talented, world-class, and complete goalkeeper, who also stood out for the longevity of his career. A tall, strong and physically imposing goalkeeper, with a large frame and long reach, as well as excellent reflexes, he was also extremely athletic and agile for a player of his size, and was known for his ability to cover the goal with his trademark "star jump" saves, a technique he reportedly developed from playing handball. He was highly regarded for his goalkeeping technique, shot-stopping ability, and positioning between the posts, as well as his command of his area, handling, and ability to rush off his line both in one on one situations or when coming out to claim crosses. A courageous and fierce competitor, he was a vocal presence in goal, known for his strong character, mentality, ability to organise his defence, and leadership from the back, as well as for his criticism of his defenders whenever they made mistakes. He was also effective at stopping penalties. In addition to his goalkeeping ability, he was also known for his capacity to read the game, as well as his adeptness with the ball at his feet, and his distribution and ability to launch swift counter-attacks with his long and accurate throws and kicks. Unusually for a goalkeeper, he would often go up for corner kicks in the opposition's area when his team were trailing, and scored 11 goals in his career. Schmeichel, Peter (2000) . Schmeichel: The Autobiography (2nd ed.). London: Virgin Publishing. ISBN 0-7535-0444-8. ^ Peter Schmeichel. DBU. Retrieved 14 July 2012. ^ a b "Peter Schmeichel". Red11.org. 1999. Retrieved 4 November 2013. ^ a b Stokkermans, Karel (30 January 2000). "IFFHS' Century Elections". RSSSF. Retrieved 21 June 2007. ^ a b "PETER SCHMEICHEL". ShowStars.dk (in Danish). Archived from the original on 4 July 2007. Retrieved 21 June 2007. ^ Nielsen, Peder I. (1999). "Danmarksturneringen 1985". Peders Fodboldstatistik. Archived from the original on 16 March 2007. Retrieved 21 June 2007. ^ a b c d e f g h i j k l m n o p q r "The great Dane with the big bark". FIFA. Retrieved 28 February 2015. ^ a b c Saj Chowdhury (12 May 2012). "Euro 1992: Denmark's fairytale". BBC Sport. Retrieved 3 November 2017. ^ "The World's best Goalkeeper 1991". IFFHS. Retrieved 21 June 2007. ^ a b "Schmeichel's MBE honour". BBC Sport. British Broadcasting Corporation. 30 December 2000. Retrieved 21 June 2007. ^ Rob Hughes (24 June 1992). "The Score From a $6 Million Soccer Star: 'Someone Had to Miss'". The New York Times. Retrieved 3 November 2017. ^ "Schmeichel steps back in time to EURO '92". UEFA.com. 18 April 2016. Retrieved 3 November 2017. ^ "Gatecrashing Denmark down Germany". UEFA.com. 5 October 2003. Retrieved 3 November 2017. ^ "The World's best Goalkeeper 1992". IFFHS. Retrieved 21 June 2007. ^ a b c d e f g h i j Tom Adams (28 August 2009). "Schmeichel: The Great Dane". United Lounge. ^ One victory, one draw, and one loss in three group stage matches. ^ King, Rob (21 February 1997). "Schmeichel faces racist abuse charge". The Independent. Retrieved 11 November 2014. ^ "Schmeichel recalls 1999 marvel". UEFA.com. 29 March 2010. Retrieved 3 November 2017. ^ "Van der Sar pens new one-year deal at United". ESPN Soccernet. 15 December 2006. Retrieved 20 July 2007. ^ a b c "Europe's goalscoring goalkeepers". UEFA.com. 9 July 2014. Retrieved 3 November 2017. ^ "Ex-Man United keeper Schmeichel signs with Sporting Lisbon". Hürriyet Daily News. Associated Press. 22 June 1999. Archived from the original on 5 February 2015. Retrieved 5 February 2015. ^ "Schmeichel calls time on Denmark". BBC Sport. British Broadcasting Corporation. 20 February 2001. Archived from the original on 17 July 2001. Retrieved 2 November 2013. ^ "Schmeichel bows out". CNNSI.com. CNN/Sports Illustrated. 25 April 2001. Archived from the original on 3 November 2013. Retrieved 2 November 2013. ^ "Schmeichel staying at Sporting". BBC Sport. British Broadcasting Corporation. 12 January 2001. Archived from the original on 20 August 2001. Retrieved 2 November 2013. ^ "Schmeichel leaves Sporting Lisbon". BBC Sport. British Broadcasting Corporation. 15 June 2001. Archived from the original on 13 January 2009. Retrieved 21 June 2007. ^ "Villa clinch Schmeichel deal". BBC Sport. British Broadcasting Corporation. 12 July 2001. Archived from the original on 18 April 2003. Retrieved 21 June 2007. ^ McKenna, Chris (2 November 2013). "Stoke 1–1 Southampton". BBC Sport. British Broadcasting Corporation. Retrieved 2 November 2013. ^ Burnton, Simon (13 April 2002). "Schmeichel agrees to cut short his stay at Villa". The Guardian. Guardian News and Media. Retrieved 2 November 2013. ^ Taylor, Daniel (25 April 2002). "Keegan captures Effenberg". The Guardian. Retrieved 8 October 2014. ^ "On the move – 2001/2002 transfers". ESPN. 31 May 2002. Retrieved 8 October 2014. ^ "Man City take derby honours". BBC Sport. British Broadcasting Corporation. 9 November 2002. Retrieved 8 October 2014. ^ Hayward, Paul (10 February 2003). "Goater punishes United". The Daily Telegraph. Retrieved 8 October 2014. ^ "Schmeichel announces retirement". BBC Sport. British Broadcasting Corporation. 13 April 2003. Retrieved 8 October 2014. ^ Grkinic, Nada (11 May 2003). "Maine man signs off". BBC Sport. British Broadcasting Corporation. Retrieved 8 October 2014. ^ "Schmeichel buys Copenhagen club". The Independent. 30 December 1999. ^ "Schmeichel loses takeover fight". The Sun. 12 September 2007. ^ "Dirty Jobs with Peter Schmeichel". Discovery.com. ^ a b c d "The best goalkeepers of all time". CNN. 9 February 2009. Retrieved 10 December 2015. ^ a b Balagué, Guillem (5 February 2010). "Casillas names his top ten No1s". UEFA.com. Retrieved 2 November 2017. ^ a b c "Mondiali, -1: da Yashin a Buffon, i portieri nella storia" (in Italian). Sky.it. Retrieved 2 November 2017. ^ a b Wilson, Jeremy. "World Cup 2014: Italy goalkeeper Gianluigi Buffon still standing in England's way ahead of clash in Manaus". telegraph.co.uk. The Telegraph. Retrieved 10 February 2015. ^ "Buffon: 'Casillas the best'". Football Italia. 19 November 2015. ^ "Is Bayern Munich's Manuel Neuer the best goalkeeper ever?". www.skysports.com. 12 May 2015. Retrieved 2 November 2017. ^ "Van der Sar ranks among the all-time greats". ESPN. 28 January 2011. Retrieved 2 November 2017. ^ a b "Manchester United greatest XI". The Telegraph. 29 January 2016. Retrieved 2 November 2017. ^ a b c d e f "Peter Schmeichel". www.manutd.com. Retrieved 7 February 2016. ^ a b c d "Peter Schmeichel". BBC Sport. Retrieved 2 November 2017. ^ a b c Wright, Nick (23 October 2015). "Peter Schmeichel: A profile of the Manchester United legend". www.skysports.com. Retrieved 2 November 2017. ^ a b c d Marshall, A.; Shaw, M. (15 November 2011). "Schmeichel in Greatest XI". ManUtd.com. Retrieved 2 November 2017. ^ a b c d Berg, Henning (10 February 2017). "FourFourTwo's 100 best foreign Premier League players ever: No.9, Peter Schmeichel". FourFourTwo. Retrieved 2 November 2017. ^ a b c d Wilson, Steve (24 May 2009). "Manchester United v Barcelona: All time greats – Schmeichel v Zubizaretta". The Telegraph. Retrieved 2 November 2017. ^ Sam Pilger (1 August 2003). "Peter Schmeichel: One-on-One". FourFourTwo. Retrieved 3 November 2017. ^ Chris Harris (20 December 2017). "'Schmeichel, Van der Sar and Casillas inspired me'". www.arsenal.com. Retrieved 9 January 2018. ^ a b Paul Simpson (12 September 2014). "Sweeper-keepers: safe hands and fancy footwork". UEFA.com. Retrieved 11 November 2018. ^ Robin Hackett (31 March 2011). "Goal-scoring goalkeepers". ESPN FC. Retrieved 3 November 2017. ^ : "Schmeichel career stats". Football Database.eu. Retrieved 14 July 2012. ^ "Schmeichel european stats". Football Database.eu. Retrieved 14 July 2012. ^ "Peter Schmeichel". National Football Teams. Benjamin Strack-Zimmerman. ^ "Peter Schmeichel – Century of International Appearances". RSSSF. Retrieved 14 July 2012. ^ a b "Peter Schmeichel: Overview". Premier League. Retrieved 18 April 2018. ^ Pierrend, José Luis (2 February 2017). "IFFHS' World's Best Goalkeeper of the Year". RSSSF. Retrieved 2 November 2017. ^ "Team of the Century: 1997–2007 – the Premiership's finest of the last decade". GiveMeFootball.com. Give Me Football. 5 September 2007. Archived from the original on 21 October 2008. Retrieved 17 May 2016. ^ "The Fifa 100". The Guardian. 4 March 2004. Retrieved 9 June 2015.